THE COLLEGE OF WILLIAM & MARY’S (W&M) Alumni House Feasibility Study prepared by Glavé & Holmes Architecture (G&HA) consists of the programming and conceptual design of an addition to W&M’s historic Alumni House. The project will be a signature design for the University that respects the existing Alumni Center’s historic architecture as well as the college’s campus aesthetic. Sited prominently near the north campus entry and the football stadium, the building will serve as a welcome center for the W&M Alumni Association functions. The design accommodates a variety of events and is an addition to the nineteenth- century building, formerly known as the Bright House. The G&HA study determined that a one-story addition was necessary to provide a 300-person banqueting space, as well as the requisite support areas. Additionally, it was evident that the existing building could be renovated to provide better efficiency and adjacencies of departments; as well as to create an over all aesthetic upgrade. 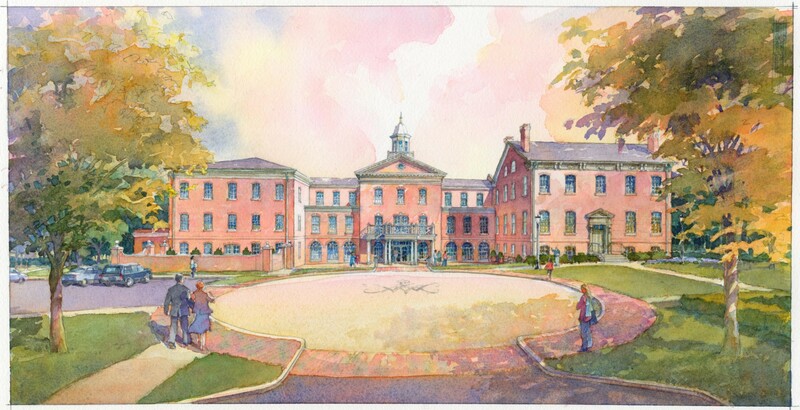 The study included a cost estimate and architectural rendering to facilitate the Alumni Association’s fundraising efforts. This project is targeting LEED Silver certification.